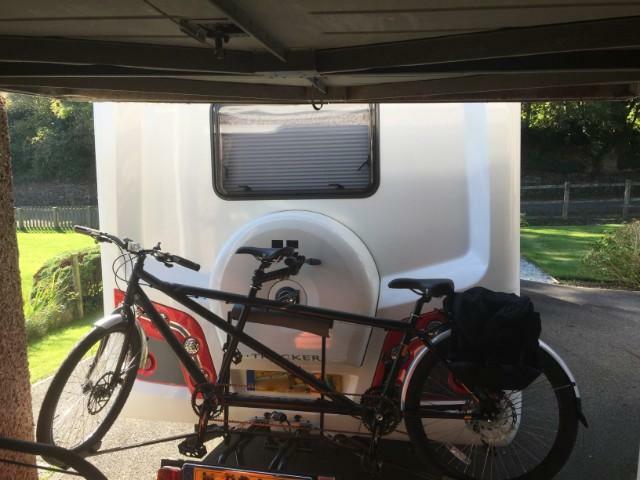 Hi,we have just purchased a tandem with the help of local sponsorship to give riding opportunities to visually impaired and other folk that would not otherwise be able to ride a bike. It is stored in a lock up garage,hie do you all store yours? I'm thinking I should suspend it somehow? Also I will sometimes be transporting it in my van,Transit size,it fits lengthwise if I turn the front wheel slightly,has anyone made a special rack or something? Thanks Michael that's a kind offer, like you,I'm not at all sure there are any advantages of suspending it,there is no danger of flooding,it was more about best use of the space which I use for work material storage.i'll message you if I want to take advantage of your offer. Keeps the tandem out of the way (about a meter off the floor). Easy to store the bike. Only downside is it might be a two-man job, depending on space constraints. That's a clever idea Achim,thanks! I got this little pully lift from Aldi a few years ago. It has been great to get our tandem out of the way. We use the bike several times a week so it needs to be easy to use - takes only a minute. Mick - regarding making a rack for your tandem, we modified a towbar cycle rack and contacted a local metal fabricator to construct a framework to sit on top of the rack. This was to fit the width of our motorhome. As you say, by turning the front wheel the width (or length) of the bike is reduced.